Photograph: Jakob N. Layman Chef Ludo Lefebvre. 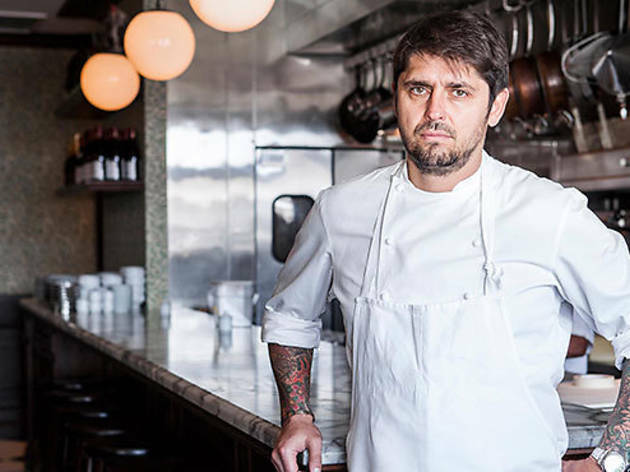 Chef Ludo Lefebvre is no stranger to controversy. 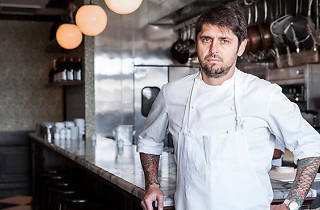 Trois Mec, his first brick and mortar that he opened last year with chef friends Jon Shook and Vinny Dotolo (animal, Son of a Gun), sparked a flurry of debate after implementing a ticketed reservation system. His new project, Petit Trois (right next door), only allows credit cards ("It's easier [than cash] for us, plus there's no stealing," Lefebvre says) and bucks reservations entirely. But if you think the French chef is a people-pleaser, think again. "People in LA can't commit three weeks in advance, so they complain about reservations. Then I tell them we don't do reservations, and they complain. What do you want? Reservation or no reservation?" Fair enough. We sat down with Lefebvre at Petit Trois to talk about his new restaurant, French food in LA, and why he doesn't do cocktails (or brunch). Time Out: Petit Trois is modeled after the bar à la carte, a French dining staple. How long have you been thinking about opening a place like this in LA? Ludo Lefebvre: For a long time. It’s exactly the lifestyle we have in France. At a little bar, you have one dish or two dishes, a drink, and afterwards you just leave. It’s not a restaurant where you’re going to sit for two, three hours. I want it to be a little restaurant where you meet everybody, you know everybody and you know everything that’s happening. You go there to meet people. Time Out: How did you go about curating the menu? LL: I picked the [French] dishes that I miss [while living] in Los Angeles. I can’t find good escargot in LA, so I included escargot, a steak tartare, a steak frite. I love steak frite. It’s difficult to find a classic steak frite here. Sometimes in America we change the way we do French food, but it was very important for me to do very classic French food, the way we do in Paris—cooked by a French chef. Time Out: Trois Mec has a great wine menu but doesn't serve cocktails. Why did you decide to include a cocktail menu at Petit Trois instead of sticking to wine, like you do next door? LL: Americans love to eat [their food] with cocktails. When I moved here in ‘96, I was very surprised to see people here eating meals with cocktails. We don’t do that in France. But I live here, so it’s about the customer, not about me. I wanted to find the best bartender in LA, and that's Danielle [Motor]...She's making amazing cocktails, using a lot of French liquor, like Chartreuse. But I don’t like cocktails. Time Out: You don't like any cocktails? Time Out: Tell me about some of your favorite restaurants and bars in your neighborhood. LL: Don't ask me that. I don't go out. Time Out: Ok. Do you have any sentimental dishes on your menu, dishes that you grew up with? LL: Chicken, definitely chicken. I grew up with chicken. It's really all about the dishes I'm missing from France...I do the food I love, and people love this kind of food, too. I'm surprised—last week we did this escargot, and I was so surprised that Americans love this kind of food. It's all about the butter—I use garlic, butter and parsley. And the omelette! People eat the omelette here and look around like they've never eaten an omelette before. It's crazy. But it's the French way—no coloration, cooked gently, a little liquid. The key to our omelette is that we use a garlic, peppery cheese called Boursin. Time Out: I heard your Croque Monsieur [only served at Petit Trois after 10pm] is like a heart attack. LL: Yeah. You get to die after. It's OK, you only have one life. Time Out: Any plans for breakfast or brunch? LL: [gasps] I don't do brunch.